The simple fact of the matter is that there are various situations when you may feel the need for a slightly warmer environment and for economic or social reasons cannot simply turn up the thermostat. If you live in an area where electricity is extremely cheap, you may want to use an infrared heater to lower your overall heating bill, but make no mistake about it: in most areas the money you save on the heating bills will go towards the electric bills. Having said all that, we understand that there are situations where you just need a room or area of the house to be warmer than the rest and we have tested several heaters to find the top 10 best infrared heaters. They are listed in the table below where we also highlighted the most important features for each one, but if you want a detailed review for each product make sure to scroll past the table to our in depth reviews. 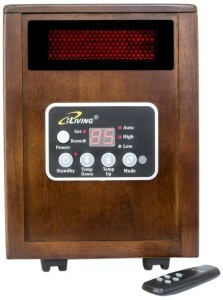 Dr. Infrared Heater is one of the most sought after heaters on the market today and it has justifiably earned a 3.9 star rating on Amazon. If that does not seem as high as some of the other ratings of the products in our table, consider the fact that it has been rated by over 760 customers, so it was bound that some people would not be as generous with their grading as others. We certainly love it because it is the best of two worlds: it uses a fan to quickly disperse the generated heat throughout the room, just like a fan heater, but it uses PTC and quartz heater so the electric bill will be as low as possible while the generated heat will be extremely high. We tested it several times during very cold weather and were very happy with how quickly it was able to warm up our 750 square feet office and how silent it ran during the whole time. In fact the cooler of one of our laptops, full on, was enough to drown out the noise from the heater’s fan. 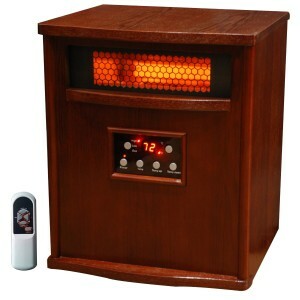 The truth is that the iLiving Infrared Heater and the Dr. Infrared are the same basic product and, although we love them both, it is very difficult to pick a favorite. They are the same right down to the wattage used, between 1000 and 1500 watts depending on the setting used. 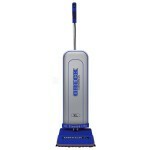 It too has a tip over protection system, in that if you tip it off a switch is thrown and it stops working. In fact you should be careful with that because if you do not place the heater on a straight surface the switch may be thrown and the heater will not work. It also has a overheat protection system which can be quite useful to protect both you and your family and it also works great to protect the heater itself. If you are the type of person who cares a lot about the Amazon rating, you are going to love the Homegear Compact heater and the fact that it has earned a 4.5 star rating. However, be warned that the rating has only come from 16 actual users of the product. Still we decided to feature it on our top 10 best infrared heaters of list because it has an economy setting that runs as low as 750W. 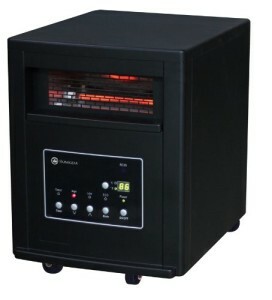 That means you can use the Homegear Compact heater to warm up a bedroom and then, provided your thermal isolation is adequate, it will be able to maintain that temperature constant with as little as 750W. If you think that you can do with even less heat than the one provided by the Homegear heater, you can choose the Lifesmart infrared heater that goes as low as 500W when set to economy mode. However, if you decide that you need a lot of heat and fast the Lifesmart heater is an excellent choice because it uses 6 infrared heating elements turning 1500W into 5200 BTUs of heat. The only problem we have had with this particular product was the fact that the fan it uses to disperse the heat throughout the room is a bit noisier than on the other heaters. It sounds almost as loud as one of those old laptops that you keep around for no other reason except it cost too much to ever throw it away. We have dedicated several reviews to the cabinet style heater but the fact is that a traditional infrared heater works just as well at keeping a room warm and it feels so much stylish because of its traditional design. Granted, the DeLonghi HMP cannot heat a room as fast as the other products we have featured, because it does not use a fan, but that also means there is nothing quieter than it. 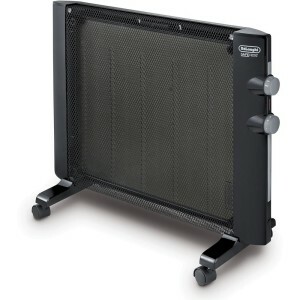 And, in the long run, it produces just as much heat since it can be adjusted to use anywhere between 750 and 1500 watts. We decided that the Lifesmart Compact Power deserved a place on our list of the best infrared heaters of the moment we saw how tiny it is. 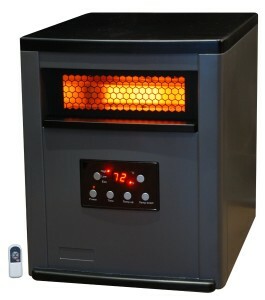 This thing will not win any awards in terms of heating power, it was only designed to heat up an 800 square feet room, but it is the smallest heater you could hope to find. It is perfect to take with you on trips, especially skiing trips where you cannot be sure if the cabin will have a good enough heating system. 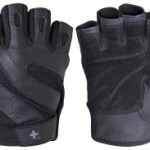 And, it is equally significant to mention that it has earned a 4 star rating on Amazon from almost 200 happy campers. 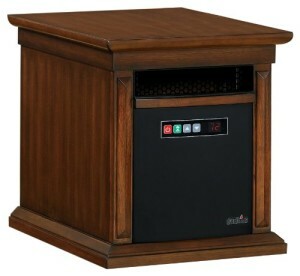 The Lifesmart Wood Cabinet Infrared Heater is just that, an excellent quality infrared heater surrounded by a very stylish, all wood, cabinet. It is the perfect full time fit for a wood cabin or for any room where you want to keep a retro feel. The wood is treated so no matter who much you turn it up, the wood will not catch fire, and, in fact the cabinet itself will feel cool if you touch it. 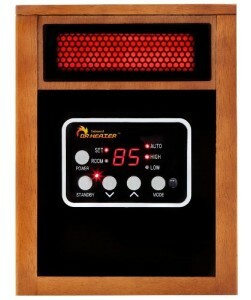 Furthermore, the Lifesmart Wood Cabinet infrared heater has an automatic power off system in case it over heats. The Duraflame Livingstone infrared heater has quite a nice antique look, but it is so well hidden that it is almost a kitsch. However, there is no accounting for taste, so if you think that you like the way it looks or that it is perfect for your library, than we can guarantee the fact that it works as well as you would want it to. 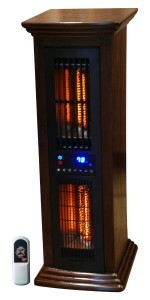 It generates 5200 BTU of heat, using anywhere between 1000 and 1500 watts. Add to that the fact that it comes with a circuit breaker in case it is tipped over, a remote control and a 4.1 star rating on Amazon, and you have yourself the guarantee of a very nice heater. The old saying that good things come in pairs is certainly true about the Lifesmart Zone Pack 2. 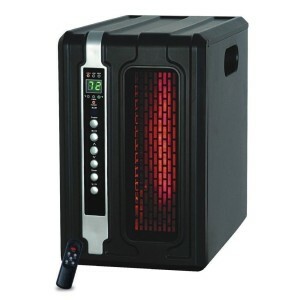 You basically get 2 infrared heater that can warm up an 1200 square feet room or can be used separately to heat up two smaller rooms. The fact is that they are the very best choice you could make for extra large rooms because you can put them on opposite sides of the room and they will keep everyone and everything nice and toasty. The best thing about the Lifesmart Air Commander is that it is both a fan in the summer and a heater in the winter. Those other units are too small for their fan to be of any practical use in the summer, but the Lifesmart Air Commander is as tall as any fan and it has a built in air ionizer. In the winter it works just as well as any other unit we have featured here, it generates 5200 BTU of heat from 1500 watts, and in the summer its fan can be powered up all the way and it is a very refreshing presence.